The recipe below is from the Raw Food Real World cookbook I used during my dabbling with raw foods. I love it with Mixed Greens, Cucumber, Shredded Daikon, Tomatoes, and toasted Sunflower or Pumpkin Seeds...you could even add a handful of toasted pumpkin seeds to the dressing, during blending, to give it more flavor. Blend all of the ingredients, except oil, in a blender until smooth. While the blender is running, stream in oil to emulsify. The dressing will be a thick, creamy consistency. Adjust any of the ingredients to suit your taste. This next recipe is from one of my Williams-Sonoma cookbooks and is used in a Crab, Avocado, and Grapefruit Salad that I LOVE!!! I omit the creme fraiche (or sour cream), increase the lemon juice, add grapefruit juice (to replace the champagne vinegar) and add ground mustard seed (to replace the dijon mustard) to keep it Paleo-friendly! So...I guess it's a major modification on the original. This dressing is also really great drizzled on grilled fish. 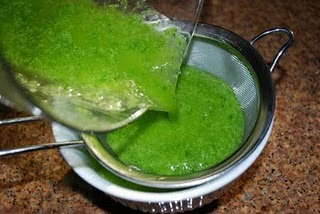 In a blender, puree the oil and chives until smooth. 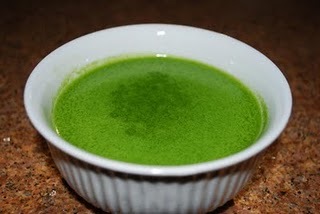 Strain out the chive pulp, if you'd, and set strained oil aside (it will be a really pretty green hue). Add remaining ingredients to the blender and blend. While the blender is running, slowly stream in oil to emulsify. This oil can be made in larger batches and used as a base for many other vinaigrettes...get creative! You can also drizzle the chive oil on grilled chicken or garnish your plate before serving, to up the presentation a bit. I don't have an exact time frame for freshness, but I've found that they will last at least a week, if not longer in the fridge. The oil will have a tendency to solidify a bit, so just bring it out to room temperature, whisk, and serve. See...fresh salad dressing is easy and so much better for you!!! So, stop buying the sugar-laden, preservative-filled, prepackaged dressings and start making your own!